This review will take a look at L-Arginine AKG 1,000 mg Nitric Oxide Enhancer. You will learn some important facts about this supplements claims of aiding with muscle building and improved muscle health. If you’re trying to choose a nitric oxide supplement, you might be overwhelmed by all the choice, so we decided to help you find information about this product’s so you can make an informed decision. The first of these is the active ingredient. L-Arginine is an amino acid that helps stimulate the production of nitric oxide in your body. Gelatin, magnesium stearate, and silica are all inert fillers, designed to keep the capsules in capsule form. Since gelatin is often made from animal sources, this supplement may not be suitable for vegetarians. The suggested dosage for L-Arginine AKG 1,000 mg Nitric Oxide Enhancer is one capsule, taken twice or three times daily. You should take the capsule with a glass of water, as you would any pill. People who should not take this capsule include children, people who are pregnant or nursing, and people with renal or liver disorders. 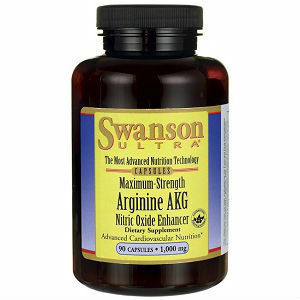 A bottle of L-Arginine AKG 1,000 mg Nitric Oxide Enhancer can be bought from the manufacturers for $9.99. Since one bottle contains 90 capsules, this should be a supply for a month to a month and a half, taken at the recommended dosage. Still, it is one of the cheapest nitric oxide supplements on the market, since one serving costs about thirty-three cents. The website for Swanson Vitamins, the manufacturers of this product, states that they offer a guarantee for a full refund for 365 days on all their products. So if you try out this product and you’re dissatisfied with your results, you can return it within a year for your money back. L-Arginine AKG 1,000 mg Nitric Oxide Enhancer seems like it is one of the best nitric oxide supplements that we’ve examined. It’s made with natural ingredients, and it’s very inexpensive, making it a good choice if you are on a budget. They also have a very strong guarantee, lasting for an entire year. However, there are some people who cannot take this product, including vegetarians and anyone with liver or kidney problems. Additionally, there aren’t a wide variety of ingredients in this supplement, meaning that it may not be as strong as other supplements that you can find. If this is an issue for you, you may consider finding a stronger product, maybe one with a wider variety of active ingredients.